Many many years ago, I went to Central Java on a trip with my family and it was time for lunch so went to this certain establishment around Yogyakarta, which of course I forgot, to eat Soto Kudus. It was not a memorable thing I remembered about soto. First of all, even though I was still little, I didn’t like it at all for a reason that I don’t even remember. I was still little, that’s forgivable but that brings a traumatic memory about how much you don’t like certain food because your first experience sucked. For instance, like many who don’t like broccoli or even sushi. Brocolli, for instance, because your mother forced you to or she don’t cook well. Sushi, because you’re foolish enough to buy cheap during minimart discount time or a too cheap sushi joint. So where’s the fault? Let’s find out. Many many years later, I was strolling around Jl. Sabang in Jakarta. It was dinnertime and plenty of choices around this backpackers vicinity. My girlfriend all of a sudden was craving for this particular Soto Kudus in an establishment called Soto Kudus Kembang Joyo. She said that she had been there with her friends and was quite contented. The place can be easily found though it’s crammed in-between buildings in this dense neighborhood. Just look for a yellow signboard on the left side if you’re coming from the intersection of Jl. Wahid Hasyim and Jl. Sabang. Just a couple of hundred meters and there you go, Soto Kudus Kembang Joyo. The serving station is in the front of the building, just order from there to the attendant and he’ll prepare it for you. Usually people order the Soto Kudus Campur in which the soto itself mixed with rice. 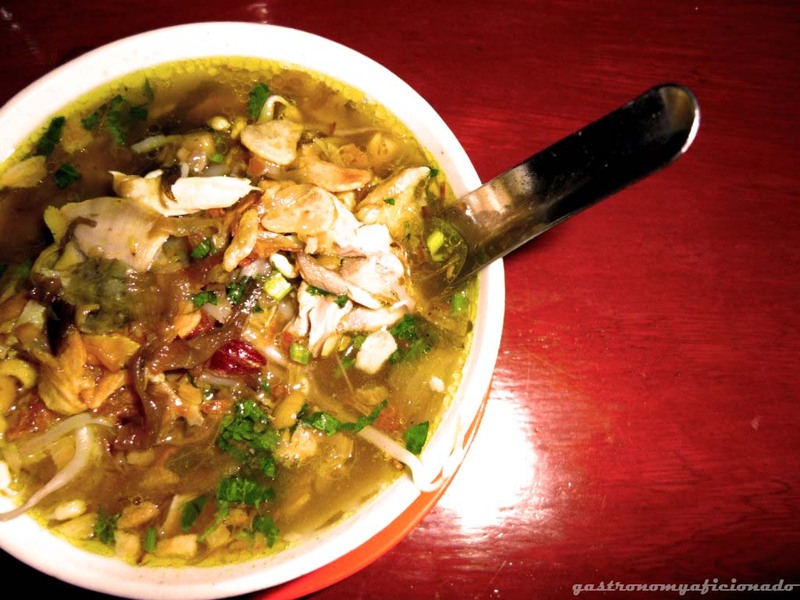 The composition of the soto is the shredded chicken, bean sprouts, celery, and fried shallots poured with chicken stock. For your information, the Soto Kudus here is served on small bowls so you might wanna dig in more by asking for another round and it will cost you IDR 9,500 per bowl. But you’ll get the sense where one bowl might be enough or at least two. It may look small but it’s more than enough sometimes. Nevertheless it was a good one and enough to recover my bruised memory from my childhood. They’re also serving in separate plate filled with satays of quail eggs and chicken innards. Don’t forget to also eat the soto with variety of crackers also served in the table. Well well.. It was a good treat but of course I expect better from the genuine Soto Kudus from the original place. From what I heard, the real Soto Kudus is a bit more liquid and sweeter but this one was too savory, but hey it’s something that I gotta find out by myself. Perhaps one day.